ADD Powder is a preparation intended for handling potentially dangerous contaminated body fluids such as blood, vomit, urine, faeces and other biological spills regularly encountered in the hospitals, clinics, nursing homes and other public areas, such as schools, child care centres, kennels, pubs, restaurants and public transport. 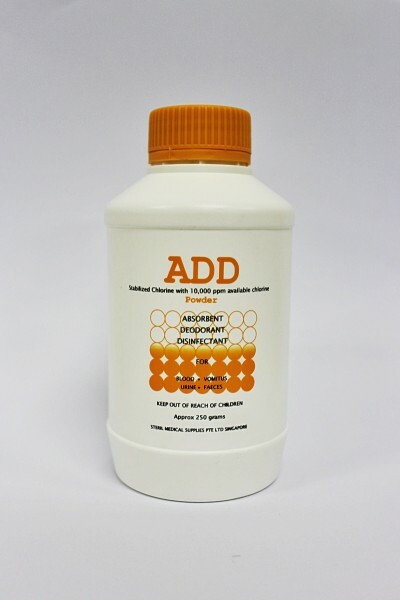 When sprinkled over any spill, the absorbent and disinfectant componenets of ADD powder rapidly absorbs the liquid and rapidly converts it into an innocuous product that can be vacummed. The spill would otherwise require the use of a mop that will inevitably widen the area of contamination and increase the risk of cross-infection. SKU: HUN 10 00 00. Category: STERIL Solutions.